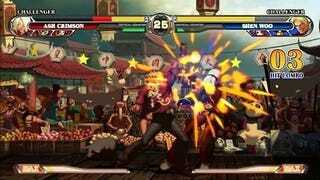 A patch, a patch, The King of Fighters XII has gotten a new online patch for the PS3 version. The patch fixes in-game issues such as buggy character combos and optimizes online matches. This update fundamentally changes the way game data is processed and synchronized during online matches, placing greater importance on the game's response time and allowing for much smoother play," states SNK Playmore. "It also prevents the player from experiencing slowdown during an online match when connections are less than optimal." Other issues that are rectified include the in-game antenna icon displayed during online battles and chat capability restrictions. An update for the Xbox 360 version will be available "very soon".